On Saturday, Mike posted a piece asking why anyone should believe the Tories about Jeremy Corbyn considering their long record of lying. He then gave a few examples, such as May’s promise that she wouldn’t call a snap election, her promise that she would seek an agreement with three other nations in Britain – Wales, Scotland and Northern Ireland before triggering Article 50 for Brexit; David Cameron’s pledge not to cut Child Tax Credits; the Tories’ promise that they wouldn’t increase NI contributions, and that they would reduce the deficit. And those are all just starters. They come from a video about the Tories’ broken promises and flagrant lying, that is included in Mike’s article. He also gives a few more example of Conservative mendacity, beginning with their lies to the rozzers about their election spending. They have also lied about not cutting the NHS, about helping people with disabilities – in fact, their lies, as repeated in the press, have helped fuel a 213 per cent rise in hate crime against disabled people, about the Trident missile test, their denials that their policies are actually causing a fall in British life expectancy. And Mike also reblogs Eoin Clarke’s list of 30 U-turns the Tories have made since Jeremy Corbyn became leader of the Labour party. Mike’s conclusion is the obvious one: Despite all the ranting, the Tories are weak and liars. A few years ago I suggested that Ian Duncan Smith should really be called ‘Matilda’, after the lying heroine of the famous cautionary poem by Hilaire Bellocq, ‘Matilda told such dreadful lies, it made one gasp and stretch one’s eyes’. Etc. But this shows that the whole party should be called ‘Matilda’, given their own contempt for truth. Mike over at Vox Political put up two pieces yesterday reporting the judgment that the 96 football fans, who died in the Hillsborough disaster, were the victims of unlawful killing. In the first article, he notes particularly that the victims and people of Liverpool were smeared, and the people of Britain deceived, by three people in particular: the head of the police, Margaret Thatcher, and the Sun under its editor, Kelvin MacKenzie. And he posted up this mock-up of how the sun’s cover should have looked in 2012 to make the point. Mike’s second article also reported that the Crown Prosecution Service is considering pressing charges after the decision of the jury. They ruled that the police, Sheffield Wednesday, and Eastwood and Partners, the construction company that built the Hillsborough Stadium, were at fault and made the serious errors that led to the deaths of the 96 fans. Crucially, the fans Thatcher and co blamed for the disaster, weren’t responsible. 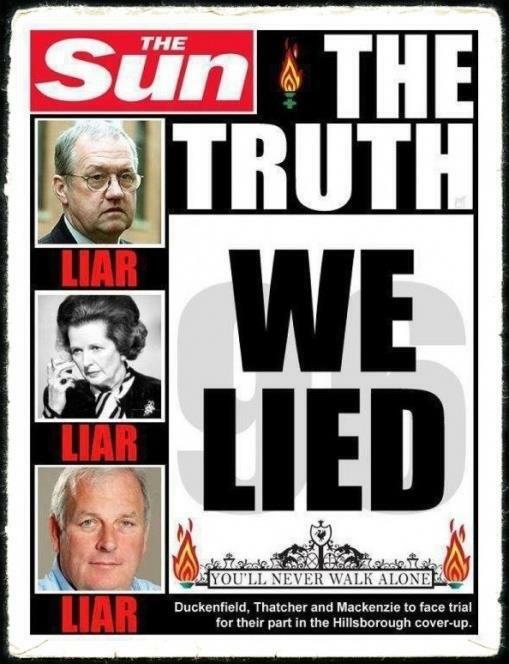 It isn’t remotely surprising that Maggie, the police chief and Kelvin MacKenzie all lied about the fans’ behaviour. Maggie had a visceral hatred of the Left and the working class, and Liverpool was a thorn in her side because of the Labour council led by the controversial Derek Hatton. The Tories wasted much taxpayers’ money launching pointless inquiry after pointless inquiry trying to prove Hatton was a crook. There was corruption on Merseyside. Merseyside council was so dodgy that it used to appear in Private Eye’s ‘Rotten Boroughs’ column as ‘Murkyside’. But to my knowledge nothing was proved against Hatton. As for Kelvin MacKenzie, he shared the political animosity of the Leaderene to Liverpool, along with the peculiar hatred of the city common to Fleet Street. For some strange reason, a large number of hacks of the time had little but contempt for the town and its people. This even extended to some of the hacks writing for the liberal papers, like the Graoniad and the Absurder. The Scum’s smears led to the paper being publicly burnt in the city, and wiped out its circulation there. In more recent years, it has apologised and tried to put the record straight. But only after Kelvin MacKenzie had departed. He hadn’t changed, and took his bile and hatred of the town to whichever rag he started editing after he left the Sun.